We have ALL been there. We establish a relationship with someone. We love them. We trust them. Then, BAM! They walk away. Sometimes, we KNOW that it was time to let the relationship go. We are all a work-in-progress. I’m on a journey. You’re on a journey. Sometimes, our paths meet. Sometimes they don’t. I believe 100% that when we are meant to move along and we choose to stay, the universe will blow things up for us in such a way that our only option is to move on. 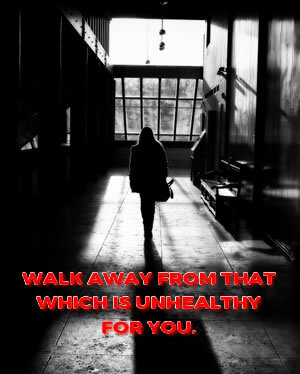 If something or someone makes you feel bad, WALK AWAY. Stick close to that which brings you joy. If something or someone hurts you, WALK AWAY. Trust your gut. Believe in yourself. If someone is controlling your behavior, dress, and isolating you from the people you love, WALK AWAY. YOU are beautiful. 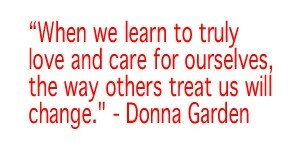 Love yourself by taking care of yourself. Remember who you are. Know yourself. Who are you really? What makes you smile? What brings you joy? Do that. It’s not about your family. It’s about you. Your family has played a pivotal role in your journey. Acknowledge them. Thank them. Whether the relationship is good or not, thank them, for it is family that teaches you the biggest lessons in life. Who has been your staunchest ally? Who has been there for you through thick and thin? Who will tell you the truth, even if it’s painful? These are your roots. Stick close to them. Get up and go on with your life. It’s all right to sit around and be depressed for a minute. Cry about it. Do whatever you have to do, but don’t stay there too long. Get up and go on with your life. Let folks go honey. Some people come into your life for a lifetime, and some come for a season. You got to know which is which. And you’re gonna always mess up when you mix them Seasonal People up with Lifetime expectations. There are people that went and got married to someone they were only supposed to be with for a season. And they wonder why they have so much hell in they’re life. That was a person who was supposed to come and teach them one thing, they didn’t know so they fell in ‘love’ and now they wonder why they have no peace nowhere they go. Listen, I put everybody that comes into my life in the category of a tree. Some people, are like leaves on a tree: the wind blow, they’re over here. They’re unstable. The wind blow, they over there. The weather changes, they wither up and die ‘ they’re gone. And that’s alright. That’s some people; most people in the world are like that, they’re just there to take from the tree. That’s all they do, take from the tree and give shade now and again. That’s all they can do. But don’t get mad at people like that, that’s who they are, they’ll never be anything but a leaf. That’s what they were put on this earth to be ‘ a leaf. Some people, are like a branch on that tree. You gotta be careful with them branches too, because they’ll fool you. They’ll get there and make you think they’re a good friend and that they’re strong, but the minute you step out there on them? They’ll break and leave you high and dry. But if you find you two or three people in your life that are like the roots at the bottom of that tree, you are truly blessed ’cause them the kind of people that ain’t going NO WHERE. They ain’t worried about being seen, don’t nobody have to know that they know you, they ain’t got to know what they’re doing for you, but if those roots weren’t there that tree couldn’t live. You understand? A tree can have a hundred million branches, but only a few roots down at the bottom to make sure it gets everything it needs. I’m telling you honey, when you get you some roots, hold on to them. The rest of ’em? Just let them go. Let folks go. Nobody said it was gonna be easy! But it’ll get easier when you learn how to love yourself. When you get to a point in your life when you look at people and go: “Okay, wait a minute. It’s you or me.” You WILL make a decision. Now, if you see someone fix it, or they even trying to fix it, that’s someone that cares. Keep them around. That’s a leaf that’s trying to grow up and be something else. You understand? But if you tell somebody that what they’re doing is hurting and they need to stop it, and they keep doing it? They don’t care ‘ move on. Let them go. No matter how much it hurts, let them go. And it’ll get easier, I promise you . Everyday it will get easier and easier and easier. You just got to make it through. You hear me honey? You gotta learn to be by yourself. People have to learn how to be alone. I don’t understand all these people. Oh I need somebody. Lord, where’s my man? Lord, where’s my woman? That is crazy as hell. If you don’t know how to be by yourself, what are you gonna do with somebody else? Stop praying about it! Shut up and wait! Go work on YOU. Hell, that’s what that time is for, to get yourself together. You would be surprised the things that people put up with just to have somebody to say they love them. That’s crazy. I don’t understand it. I can’t live in dysfunction. I’m sorry. I’ve been through too much, been through too much hell and high water to come there and let you come up in my adult life when I’m supposed to be at peace and give me all kinds of hell. Only two places on this earth you’re gonna have peace, your grave and your house. Now if you wake up in your house and you’ve got no peace something is wrong. I’d rather be in a corner by myself with a puppy and a goldfish and be happy than be sitting around with somebody up in my house and I’m wondering what the hell they’re there for. It DOES get easier with time. When you think about incidents or people who have hurt you and you no longer feel pain, YOU KNOW YOU HAVE HEALED! If you would like support around this issue, please contact me.